There might be a way instead to use patcher for adding (not changing) the Menu Text Entry in Server Dialog to import just the .res like the patcher for WinXP in vista look works, using the few kb big ResHacker.exe and with command import the changed .res. In 2 steps: 1. Patcher does change the bytes for no up/download limit/Ratio. 2. Import/Replace the dialog changes from the .res file. 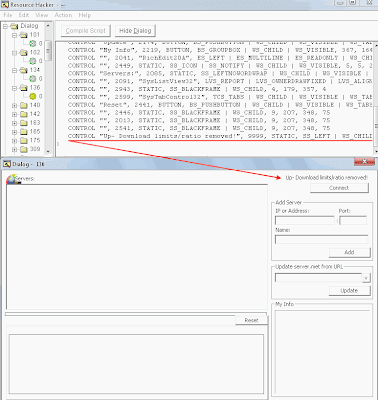 Right now it will be a big size patcher till other solution have been found. 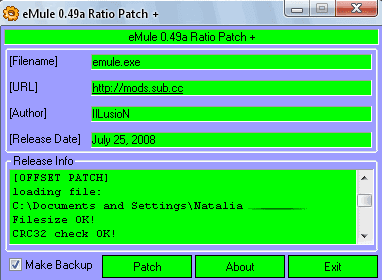 All Credits to those who ever did created/made patches for emule binaries or Hex edit the emule exe. My Thanks to KiDr0Ck0! It is possible that some "*bad" AntiVirus Programs dislike Patcher Engines cause they can change the file, and shown the typical "FALSE POSITIVE" to prevent people using patcher. Of course it is possible to hide those false positive by using not upx or any easy to read or listed packer/protectors but commercial protectors such as Armadillo or some kind of aspack/asprotect might be in combination with as-scrambler etc.. I dont want and have anything to hide so I do not use such methodes. 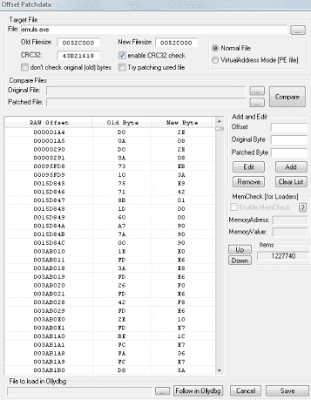 The used Patch Engine is diablo2oo2's Universal Patcher 2.17 + UPX 3.03. *"Bad" in meaning of these AntiVirus can not scan what the patcher does and simple have listet it as virus before doing deep analyses for lazy AvScanner Products it is easier to list some packer and patcher as a Virus before support scanning the results.